Elasticity is an economic concept which refers to the responsiveness among consumers or producers to a change in a variable which affects either the market demand or the market supply. • Price Elasticity of Demand (PED): Measures the responsiveness of consumers of a particular good to a change in the good’s price. • Cross-price elasticity of Demand (XED): Measures the responsiveness of consumers of one good to a change in the price of a related goo (either a substitute or a complement). • Income Elascity of Demand (YED): Measures the responsiveness of consumers of a particular good to a change in their income. 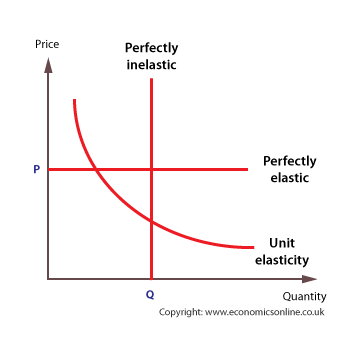 • Price elasticity of Supply (PES): Measures the responsiveness of producers of a particular good to a change in the price of that good.